This is the hardest part of winter for me. We had a beautiful respite on Saturday- sunny and warm enough for light jackets- but we've plunged into freezing temperatures and snow again. And while I wouldn't mind hiding under the covers until March (maybe even April) with this book, that's not an option with these two bouncy little people. So it's time to dig deep. Here are twenty-five ways to motivate me to get through the rest of winter. Hopefully they can help you too! 1. Draw in the sunshine with glittery markers. 2. Make play-dough. This recipe from Kids Activity Blog uses conditioner & cornstarch. 3. 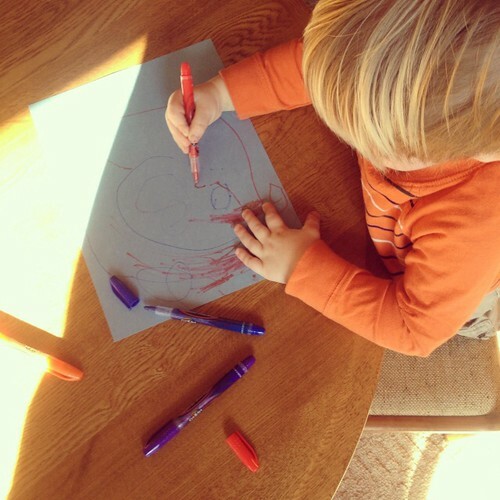 Cover your kitchen floor with large paper and let the kids loose with markers! 4. Or let them stomp paint! Here's a great activity from Mess for Less. 5. Place different textures under paper (onion bag, washcloth, etc) for crayon rubbings. 6. Make lemonade! Using a lemon juicer is perfect for building little hand muscles. 7. Play with your food. Simple faces make my kids laugh & get excited about new foods. 8. Create some edible snowflakes with flour tortillas. So yummy! 9. Make oatmeal special with a scoop of ice cream & cinnamon-sugar sprinkled on top. 10. Large mugs of steamy hot chocolate make any day better. 11. 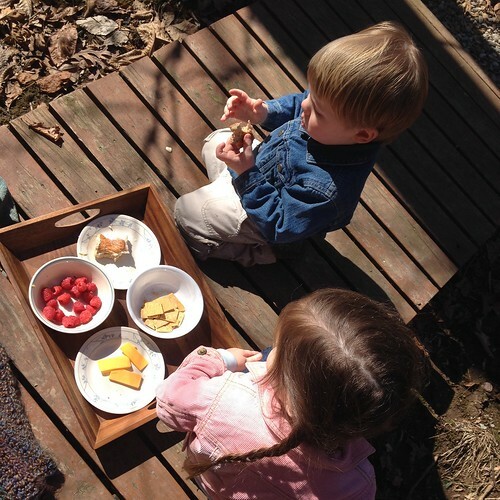 Have a picnic, indoors or out. 12. Make a blanket fort to snuggle in and read books. 13. Play flashlight hide-and-seek. Even during the day my kids love this. 14. Middle-of-the-day bubble baths are a fun way to warm up little hands and toes. 15. Hang a bird-feeder (or make some birdseed ornaments) for great bird watching. 16. Snack often! Little individual quiches with crescent rolls are a household favorite. 17. Double soup recipes for freezing. Even better, swap an extra batch with a friend. 18. Bake this beer bread! Perfect for little helpers to sift flour & watch the beer fizz. 19. Making crackers has been on my list this winter. This recipe looks like a keeper. 20. Let your kids prep soft fruit. We use butter knives but plastic works too. 21. Go outside at least once a day, especially if you don't want to. 22. Have a project! Knitting is a good distraction for my hands and mind. 23. Call a friend. I tend to recluse in winter, which is when I need my friends the most! 24. Go to bed early with a good book. 25. Drink lots of tea. Peppermint is good for energy, roobios is helpful for moody days. Ugh, do I ever struggle with winter. I haven't been disciplined with my UV lamp either, so this year has been a rough one. We have a prism in our kitchen window and it makes rainbows all over our walls. Love it! I also make "tropical" smoothies with coconut milk, pineapple, banana, and mango (great mood lifters/spirit boosters). A prism is an excellent idea! And I have a pineapple that's now going to go into a smoothie, that sounds perfect. Cool ideas! And, oh, you forgot to include "Sew comfy and warm robot pajamas for your kids!" (a must this winter! ).